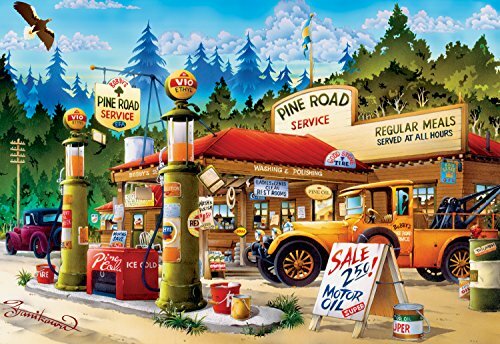 This incredibly detailed 1000 piece jigsaw puzzle will make you nostalgic for family road trips and the days of old-fashioned road-side service stations. Based on the artwork of Japanese artist Hiro Tankikawa, Pine Road Service is a throwback to classic cars and simpler living. Every Buffalo Games jigsaw puzzle is manufactured in the U.S.A. from recycled puzzle board. A precision cutting technique guarantees that every piece will fit soundly with the company's signature Perfect Snap. A bonus puzzle poster is also included so that you have a handy reference of what the completed puzzle should look like while you put yours together.